M&M’s cheesecake is thick, creamy, chocolaty and has all of the flavor of those cookies we all love so much. I found a cool image editing program that I’m playing with for book covers but right now I just like putting them on the blog. They just look like fun, don’t they? So it has been forever and a couple of days since I posted anything. We have been so very busy with my son being here, Christmas, and to top it off I have a couple of fabulous new clients. Life is the best it’s been in such a really long time and it just keeps getting better. Don’t you love when things feel that way? I have always had a thing for red M&Ms. When my older kids were little I had them convinced that the red ones were always mine and they saved them for me. In fact, they usually still do but now it’s just because the love me. Red tastes better. So, when I set this cake on the table the first thing they wanted to know was why the red M&Ms were part of the cake. Have you made one of my cheesecakes yet? If you have you know that they are rich, creamy, and perfect — if you’ll allow me bragging rights. 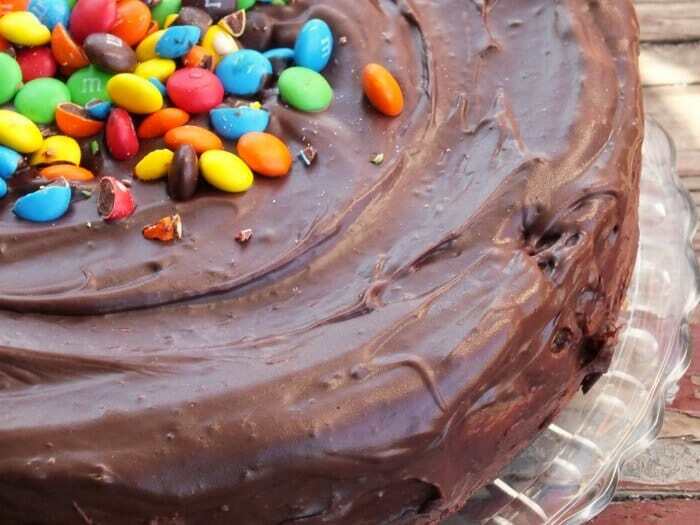 This cake is all of that… it has that brown sugar vanilla flavor that M&Ms cookie dough has. I added M&Ms to the batter but I wasn’t thrilled about that part. The candy melts in the batter. It does kind of leave blots of color in the cheesecake and I haven’t figured out how to stop it from melting. So much for melting in your mouth, not in your hand. Still, even with the melting? It’s delicious. This is a fun dessert. It isn’t elegant or classy. C’mon y’all, it’s M&Ms. 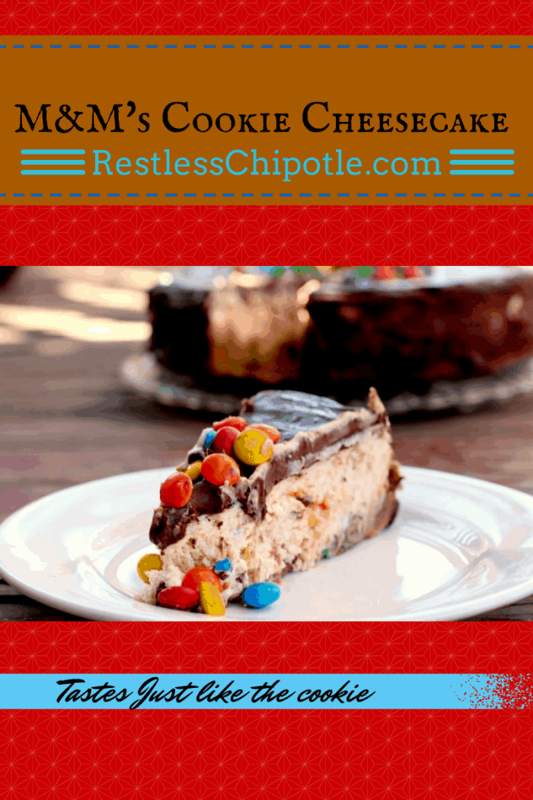 Creamy, dense cheesecake that's studded with M&Ms, covered with creamy ganache, and sprinkled with more M&Ms. It's colorful and fun but most of all it's delicious. Add eggs one at a time, slowly mixing in for about 2 minutes after each addition. Fold in vanilla, 1 cup of the M&Ms, and sour cream by hand. Pour a layer of the batter into a prepared crumb crust in the springform pan. Put the cheesecake pan in a 12" cake pan with high sides and put into a 375F oven. Pour hot water into the 12" pan until it comes halfway up the sides of the cheesecake pan - don't let it go over the top of the aluminum foil! Heat the cream until bubbles form around the edge. Remove from heat and stir in the chocolate until smooth. Pour the ganache over the top, smoothing and letting it drip down the sides as you go. Sprinkle with the remaining 1/2 cup M&Ms. Never use low fat anything in this cheesecake. Also, I use Daisy sour cream because it doesn't have any added ingredients - a lot of brands have thickeners and other unnecessary ingredients. The recipe is high calorie as are all good cheesecakes but it isn't something you are going to eat every day either. 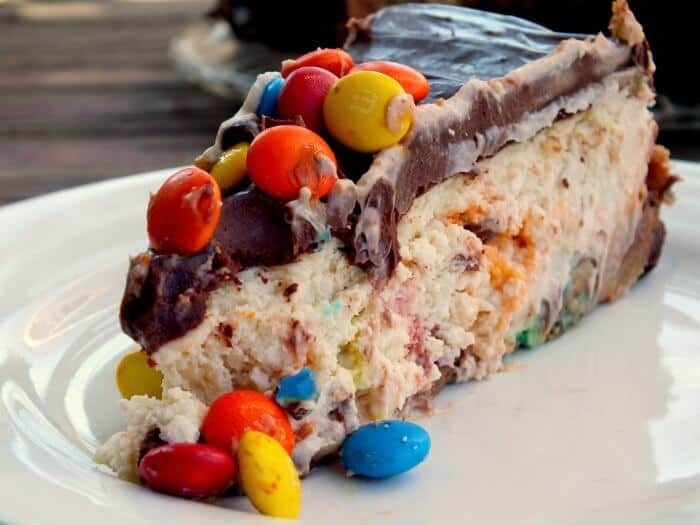 M&Ms in a cheesecake, I’m sitting here wondering why I never thought of that. I can’t even tell you how much my boys and their friends will love this. I may have to make two.